Why Plasma membrane or Cell membrane is Semi-permeable or Selectively permeable? Plasma membrane is a thin, semi-permeable membrane that serves as a boundary between the interior of a cell and its extracellular environment. It is present in all prokaryotic and eukaryotic cells. In plant cells and bacterium, a thick outer wall is also present, called as cell wall. Why Plasma membrane is selectively permeable or semi permeable? This property of selective permeability is responsible for keeping a cell ‘as a cell’, an individual self sustaining unit with a constant internal environment. Selectively permeable membranes can differentiate and discriminate between substances, allowing some to pass and others not. It controls the entry of nutrients and exit of waste products from the cell. This trafficking allows cell to maintain an intracellular environment without the interference of outside substances. It takes in raw materials from the outside and synthesize complex organic molecules and keeping the products inside and remove waste products of these cellular activities. The pH and volume of the cell is maintained by regulating the concentration of ions inside. The passive flow of ions into the cell without ATP loss or energy is achieved by creating a concentration gradient across the membrane by regulating ion concentration outside and inside of the cell. What types of molecules that pass through the cell membrane? The size of the molecules which can pass through the plasma membrane is 1-15 A0. Gases like O2 and CO2 can diffuse rapidly in solution through membranes. 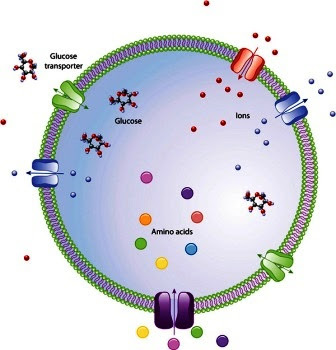 Sugars, amino acids and charged ions are transported with the help of transport proteins. The bulk transport of materials across the membrane takes place by exocytosis or endocytosis.